“Value creation through change” is the corporate philosophy of DIGEN. DIGEN employees are never satisfied with the present. Endless research and development based on a creative and innovative mind in pursuit of new answers are most important. Nothing is achieved by those who never accept new challenges. The basic mindset of DIGEN is to accept new challenges based on endless passion. 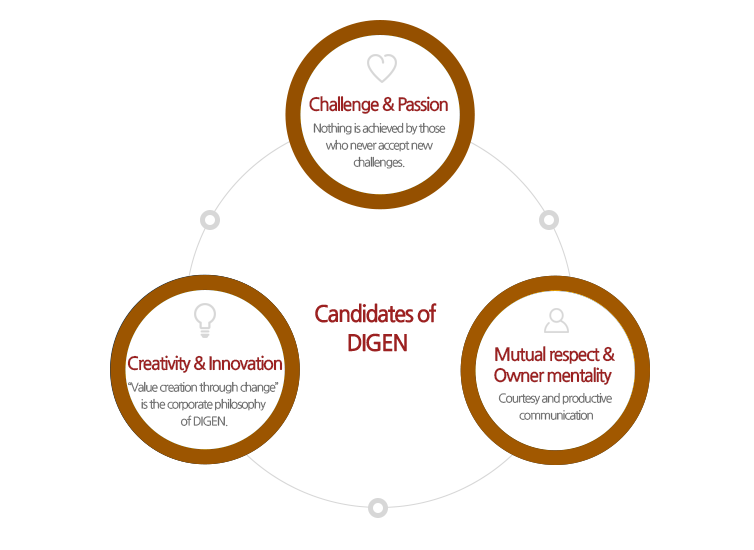 DIGEN employees pursue common values and goals through courtesy and productive communication based on rationality and respect and conduct activities through an owner-mentality. Such is the foundation of trust between DIGEN employees.